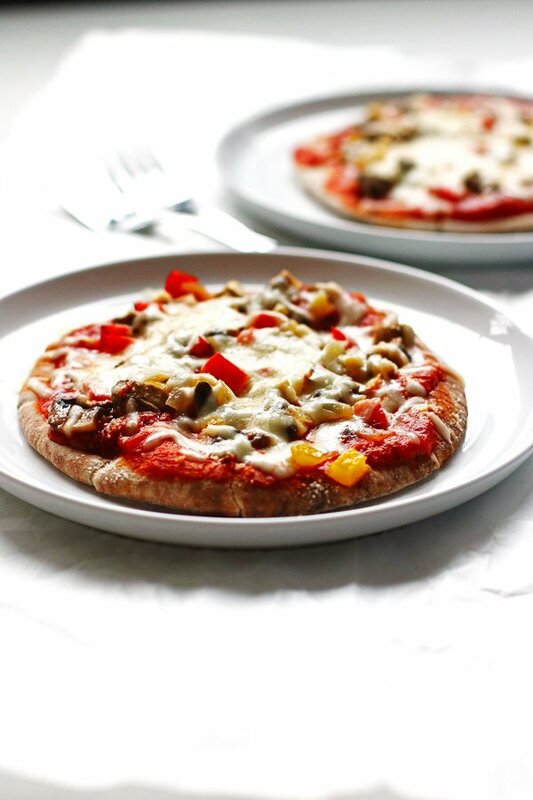 This recipe for Veggie Pita Pizza is a great one for nights that you want to make a nutritious dinner but don’t want to spend a lot of time in the kitchen preparing it. If you love pizza, you will love this recipe. It is easy to make…a win for the cook in the house! They are made on whole wheat pitas…win for all! They are nice and cheesy…win for the kids! It’s a vegetarian pizza…win for everyone! The deal I make with my daughter is if she eats one of the vegetarian pizzas, I will make her a pita pizza with just sauce and cheese. Win for Mom…win for my daughter. :o) She likes the Veggie Pita Pizza, but I think she might like plain cheese pizza just a little more…you know how little kids like to eat. 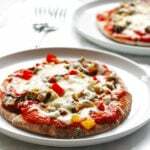 To make this pizza recipe, you’ll just need to dice up and cook the peppers, onion and mushrooms in the oil and garlic powder. Cook them until they are nice and tender. I use my Lodge Cast Iron Skillet for this recipe (and just about all my recipes that use a skillet). I love how it cooks and cleans up easy. To clean my cast iron skillet, I use this Cast Iron Cleaner . A little scrubbing with this gadget while the skillet is still warm (if not, just add some warm water to the skillet) and it cleans up so nicely. Then I just make sure it is nice and dry and coat it with a little olive oil and it is like new. Pour sauce over each pita pocket. Evenly divide up the veggie mixture over each pita. Sprinkle mozzarella cheese over them. Sprinkle a little grated parmesan cheese over each one (optional). Pop them in the oven and let them bake for 10-12 minutes. The sauce and cheese amounts in the recipe are what work for our family. If you like your pizza to be a little more saucy or cheesier, then by all means…add more. I just want to give you an idea of how much sauce and cheese will be needed. I hope you love them as much as we do. Sausage and Peppers Pizza ~ a blend of peppers, Polish sausage, and cheese for this one. Breakfast Pizza ~ scrambled eggs, peppers, onion, ham and cheese are the stars in this pizza. Buffalo Chicken Wing Pizza ~ if you love chicken wings…this pizza is for you! I live in the Buffalo, NY area. We are chicken wing kind of people! Okay…go get your pizzas baking! Have a great day! 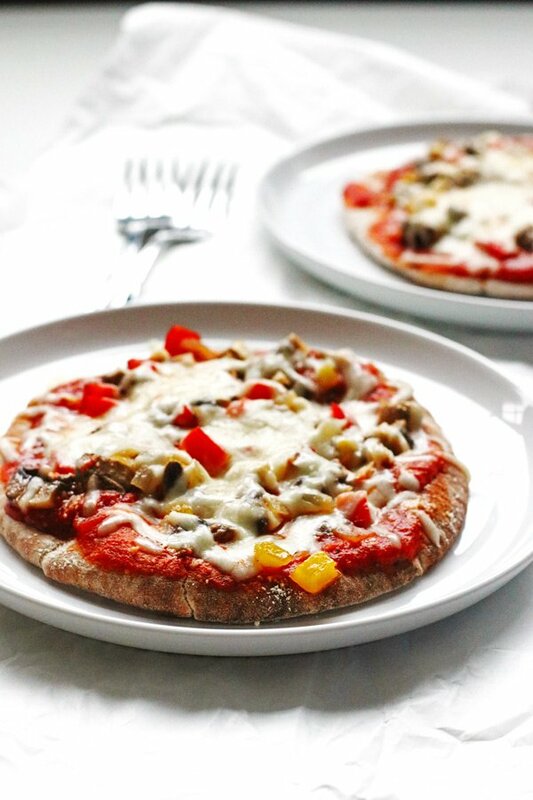 This Veggie Pita Pizza recipe makes a great quick and easy vegetarian dinner recipe. Preheat your oven to 350 degrees. Cover your baking sheets with parchment paper, foil or silicone mats. Pour the olive oil into your skillet and turn on medium heat on your stove top. Add diced peppers and onion to the skillet, sprinkle with the garlic powder and stir. Cook until the peppers and onions are slightly tender, and then add in the mushrooms. Cook until everything is tender, stirring occasionally. Place the pita pockets on your baking sheet and cover evenly with the sauce, veggie mixture and mozzarella cheese. Sprinkle with parmesan cheese (optional). 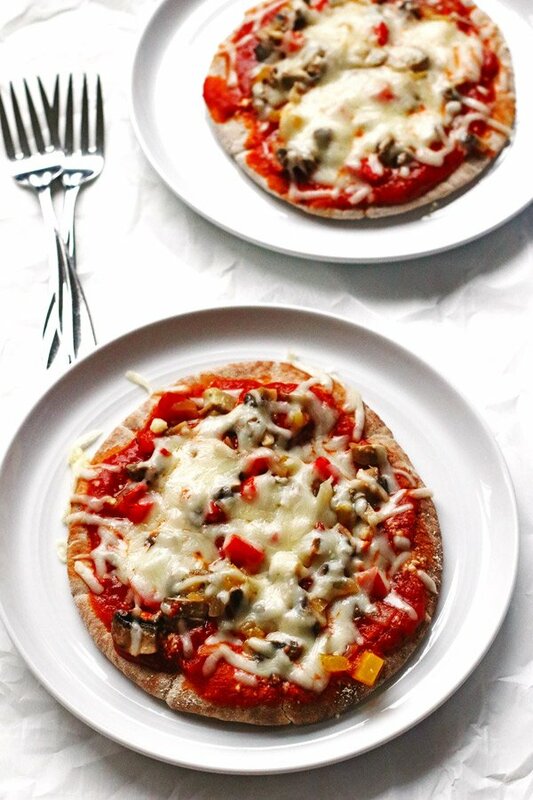 Great idea using pita bread as the base for the pizza! my kids are the same way, the love pizza with just sauce and cheese, but they have to eat there veggies! Thanks Albert! Yes…gotta get those veggies in!